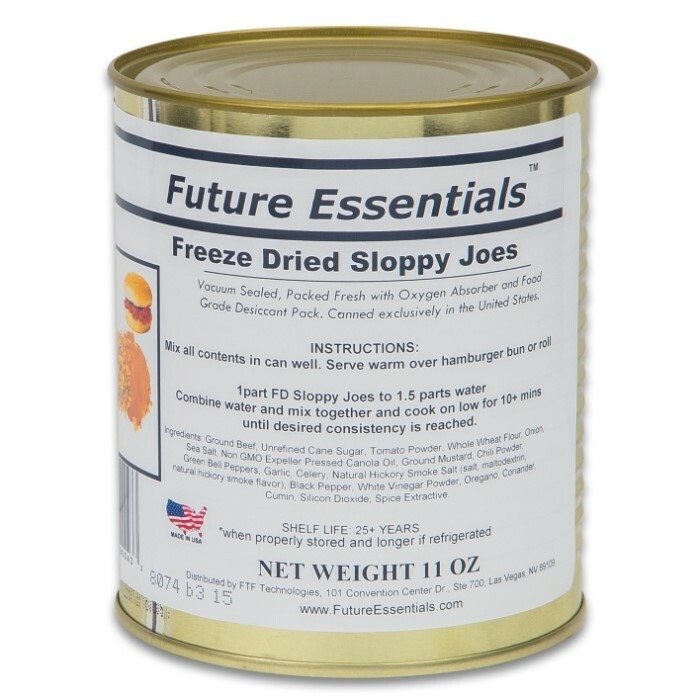 Future Essentials Sloppy Joes Mix - Real Cooked Beef, Vegetables, Just Add Water, 10.7 Ounces - 20+ Years Shelf Life | BUDK.com - Knives & Swords At The Lowest Prices! This good old American Favorite is sure to put a smile on your family’s face. Just add water and you are all set, but don’t forget the buns! This recipe is made with real cooked ground beef, onions, bell peppers, and tomatoes creating that chunkiness texture for your sandwich. Each 10.7-ounce can serves about four people depending on serving size. It is non-perishable, requires no refrigeration and is ideal for camping, travel, and long-term food storage.